It is unlikely that the national coalition in Afghanistan, which the US has stitched together, will last. More likely, the Unity Government provides a convenient cover of artificially generated “peace” allowing the US to withdraw, with “honour”, from the “graveyard of invaders”. Once it leaves, the US shall make all efforts to secure a working relationship between the Taliban and the Afghan Unity Government. The US has already started distinguishing between the palatable, if misguided, Taliban, with whom business is possible and the utterly untouchable Al Qaida. The new Afghan President, Ashraf Ghani seems comfortable with cutting a deal with the Taliban to include them too, in the fullness of time, in the power sharing structure. This approach also fits well with the traditional “big tent” approach of the US which also includes decentralizing power and thereby enhancing inclusion of hitherto marginalized segments. This option is worth a try, but is likely to fail just as surely, as the existing Unity Government. Mr. Ghani is a knowledgeable, well-meaning and committed, if somewhat unbending, politician-international bureaucrat-academic. His main problem will be similar to what Manmohan Singh faced in India. How does a personally honest leader turn a blind eye to massive corruption and yet retain control over the government? Mr. Ghani says his first priority will be to make it difficult to be corrupt by improving governance systems. The conundrum is that “power sharing”, almost by definition, means allowing warlords a long rope. Manmohan Singh called it the “dharma of coalition politics”. Once executive control is loosened to avoid the personal association of the leader with the expectedly bad decisions of the warlords, stopping the system from unravelling is tough. In his last political assignment (2002 to 2004) Mr. Ghani was Finance Minister in Afghanistan and was very successful in introducing some order and economic sense into governance. The parallels are ominous. Mr. Singh too was outstanding as Finance Minister in India before he got the top job. It doesn’t end there. Like Manmohan Singh in 1999, Ashraf Ghani lost his first election in 2009. 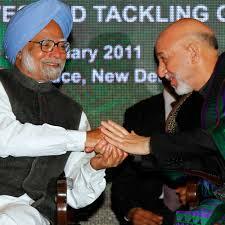 The question then is: will Mr. Ghani be Afghanistan’s Manmohan Singh; a good man heading a bad outfit? Only time can tell. For India, the current situation is impossible. There is little to distinguish the Pashtun dominated Taliban from Pakistan’s military de-facto rulers. This is why, traditionally, India cozied up, during the anti-Soviet war in Afghanistan (1980s), to the “Northern Alliance” comprising the Hazara, who are determinedly opposed to Pashtun rule; the Tajiks who are today represented by Abdullah Abdullah, the number two leader in the Unity Government and Abdul Rashid Dostum, the indomitable Uzbek leader- who is currently allied with the Pashtun, President-Ashraf Ghani. Any talk of an Afghan government, propped up by the Taliban, cannot be music to either India’s ears or acceptable to Abdullah Abdullah. This is especially so because China does business with Pakistan quite happily and is unlikely to have any qualms about doing the same with the Taliban. In this calculus any gain for the Taliban, is a gain for Pakistan and for China and a loss for India. In the shadows is Putin’s Great Bear which is constantly sniffing about for a pot of honey in the great game. India and the Soviets have a long association of friendship which can become the basis for a coalition of the “underdogs” in Afghanistan. India is also friends with Iran, which it uses to trade with Afghanistan. The Russia, Iran, India (RII) axis will become India’s fallback option if the US continues to duck its responsibilities in South Asia. The result will be the “RII axis” playing “spoilers’ with consequential instability and strife in Afghanistan. The silver lining is that India’s PM Modi has already signaled a preference for a more positive strategy of alignment with the set of countries which represent the shared ideals of democracy, markets and private sector led equitable growth. This approach advocates caution and restraint in committing our scarce resources to secure our near-abroad, whilst we still face enormous challenges of dealing with domestic infrastructure and poverty. PM Modi stressed during his recent US visit that there can be no “good terror (read Taliban) and bad terror (read IS and Al Qaida). The networks of terror and the resources available to them are fungible and transmute constantly to escape identification. In simple language, a Leopard cannot change its spots. The only option is to isolate and confine it once it turns man eater. What is unknown is whether President Obama has his ears tuned to South Asia or will the IS and the Middle East pre-occupations distract him completely. Will he be forced to soften his currently anti-Sunni terror stance by turning a blind eye to the Sunni-Taliban in Afghanistan? Great powers have to choose their battles and prioritise across options. If the choice is between completely browning-off Saudi Arabia and its cohort of Sunni Middle Eastern countries by pursuing Sunni-Terror doggedly, on the one hand and worrying about how this approach could impact India’s interest, we know which way he will jump; and who can blame him for that. If India is actually part of the “big boys club” we must mobilize pressure from constituencies who have similar interests in containing terror to force the US to not “step off the plate”. If this fails, as it probably shall, the option is to build a coalition against terror with China, which is similarly affected by it. Testing times loom for India’s diplomats.